I’ve got a couple of books still in-between bindings, with pages here and there and stitching half finished – one being my huge project that I’ve been working on since the start of February, and is about a third on the way to being back into a usable book. But anyway, onward to the finished stuff! 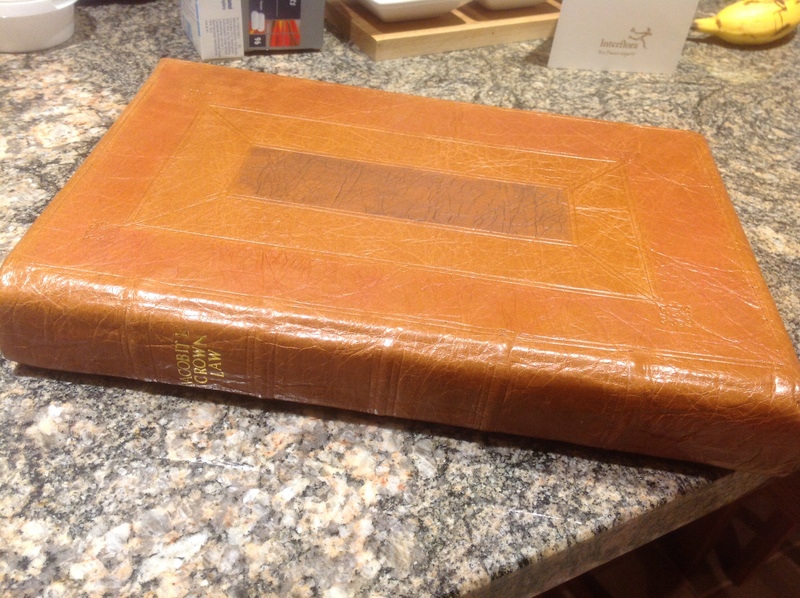 The other binding I’ve been working on is for a book with a curious history; it came to me with no binding at all, but the pages still stitched together and solid. It’s a book of court cases relating to the Jacobite uprising of 1745 printed in the 1760s – but the end papers of the book date to about 1822, and an old 20th library card inside the book describes it as having an even more modern cloth binding. 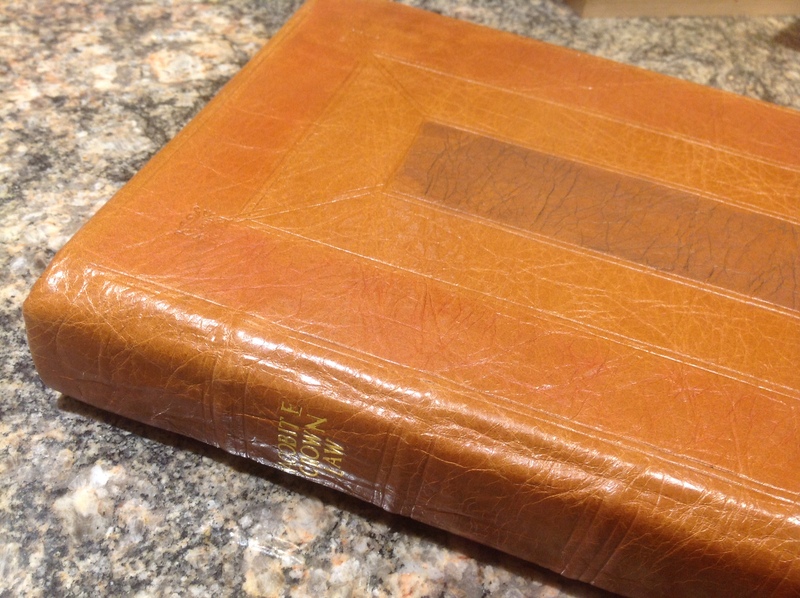 If the end papers weren’t reused when the book was given its 20th century binding, then this new binding is the fourth that this book has had in its 250 year history. Lets hope this one has more luck than the others! 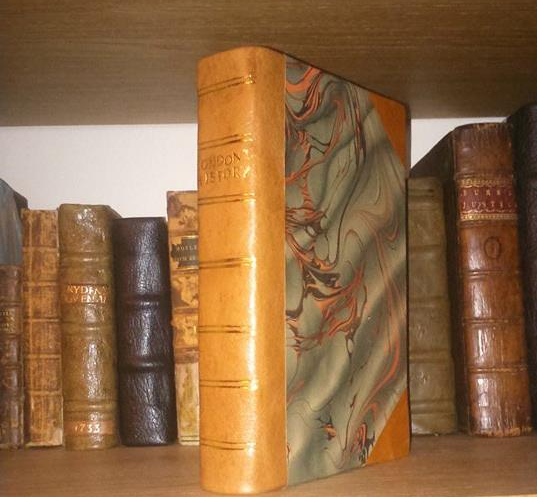 For this binding I had a go at a paneled calf binding – also known as a Cambridge or Colonial binding – which would have been just going out of fashion when the book was printed. The binding was done in a light tan coloured calf, then tooled to define the panels, which I coloured using an oil-based dye since the way the leather had been tanned meant it would not take a water-based dye. The title was then added by hand in gold afterwards. A detail of the tooling, the book itself is over a foot tall. I can’t wait to get my next post finished, it’s a tale of something quite ancient indeed! Until next time, dearest reader.